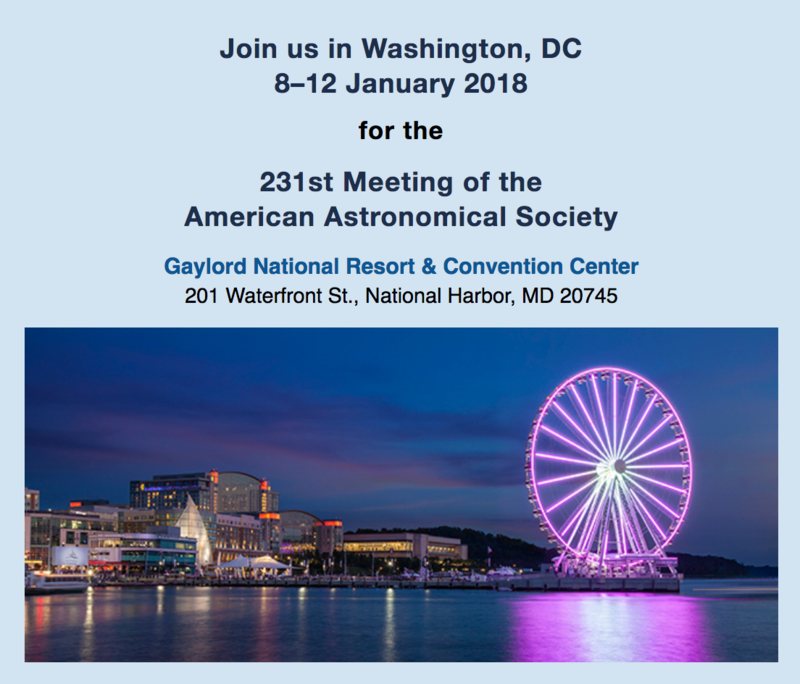 Find us at the MAST table in the STScI booth at the AAS 2018 winter meeting. We also welcome your feedback and would be happy to discuss how we can better support your science programs. Follow us on Twitter @MAST_News and during the meeting using the hashtags #aas231 and #MAST. Feel free also to send us a direct message and setup a time to meet one-on-one to discuss your projects or questions. We look forward to seeing you in National Harbor! Users can now browse a knowledge base for MAST usage guidance, or submit tickets for questions or issues, through a new web-based platform. On December 1, 2017, MAST began using a new service for archive help desk questions. While archive users can still email their questions to the help desk as before, the new website (http://masthelp.stsci.edu/) contains Knowledge Base articles that answer many common questions users have. Articles include Accessing the Staging Disk, Retrieving proprietary data through the MAST Portal, PIs - Managing Subscription Notifications, and more. New articles will be added as needed. 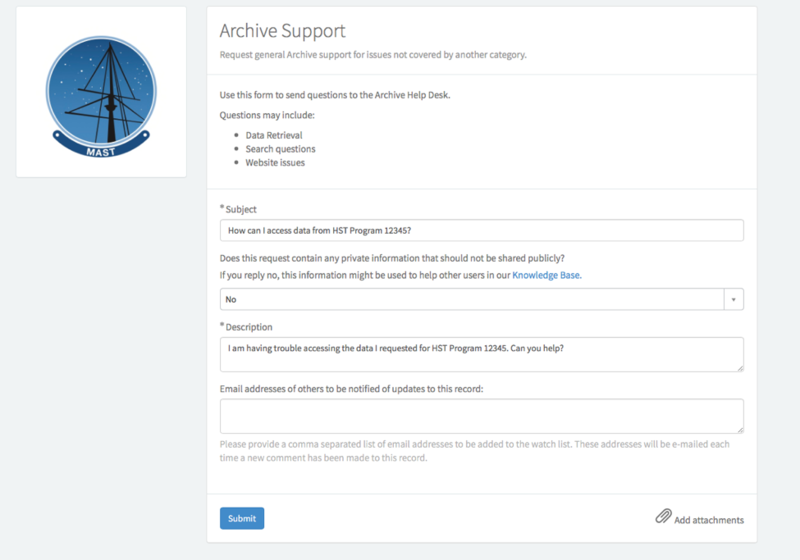 Archive users can also ask questions directly through the website by clicking on “Get Help With the MAST Archive.” This provides a form (Fig. 1) to send questions directly to the archive help desk. The form also asks whether the user’s question contains private information. Answering “No” lets the help desk operators know if the question and response can be used in future Knowledge Base articles. Fig. 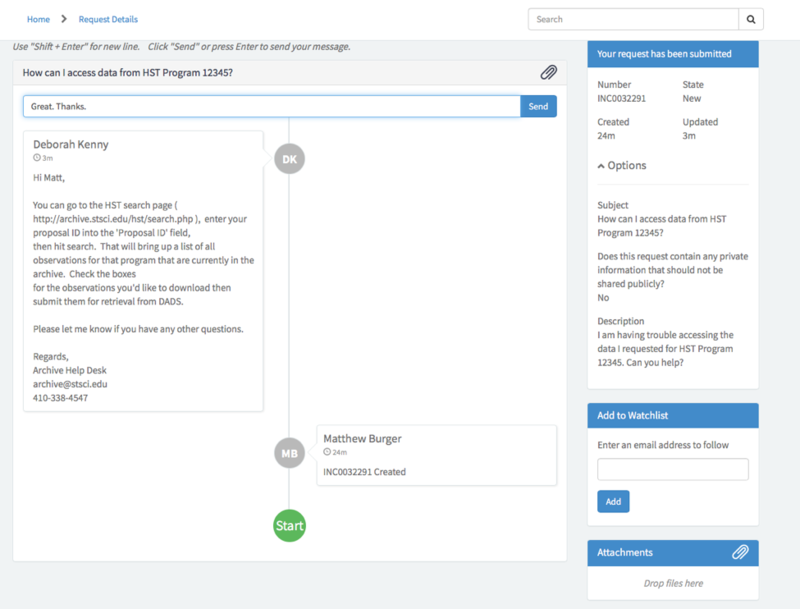 1 - Users are able to submit tickets with questions or feedback through the new help desk site. The help desk site will also allow users to track the progress of pending tickets and provide any additional information or ask follow-up questions (Fig. 2). Users will also receive email confirmations for all ticket submissions and updates. Fig. 2 - Users can keep track of pending tickets through the new help desk site as well. Note that for full functionality of the Archive Help Desk website, it is necessary to register for a MyST Account. This is the same account needed to access proprietary MAST data and other STScI services, so many users will already have one. A beta version of the new Disk Detective MAST catalog is available for testing and feedback. This catalog aims to provide a sample of mid-IR bright objects with classifications and parameters in preparation for JWST. DiskDetective.org is a NASA-sponsored citizen science website designed to crowdsource visual analysis of potential circumstellar disks in the AllWISE catalog. Since the site launched in January 2014, over 30,000 users have made more than 2.5 million classifications of WISE sources, flagging obvious non-disk sources (e.g. 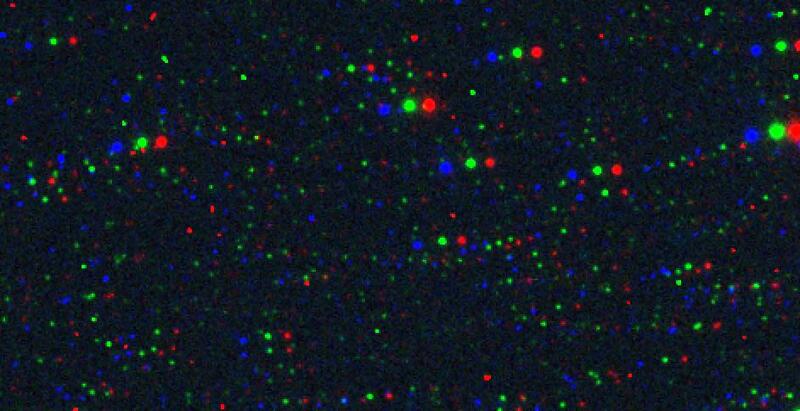 galaxies, image artifacts) and identifying clean point sources with 22-micron excess. To date, over 180,000 sources have been completely classified by citizen scientists around the world. Disk Detective has identified the first debris disk around a star with a white dwarf companion, and the first “Peter Pan” disk, a potential new class of circumstellar disk. The Disk Detective MAST catalog, funded by the Space Telescope Science Institute, combines several existing all-sky catalogs along with crowd-sourced visual vetting of optical, near-IR, and mid-IR images of 412,000 sources that have significant emission between 1 and 22 microns. The goal of the catalog is to provide the astronomical community with a high quality sample of mid-IR bright objects that have been classified by their visual appearance in preparation for the launch of the James Webb Space Telescope. The catalog includes cross-matches of sources from AllWISE, 2MASS, Gaia DR1, the APASS DR9 survey, the TESS Input Catalog (TIC), and the MAST PanSTARRS catalog, including optical, near-IR, and mid-IR photometry, accurate parallaxes, and proper motions. The catalog also includes the latest vetting parameters, such as the number of classifications and the raw classification numbers. The definition of the classifications is located at the Disk Detective FAQ. The catalog also provides links to each object’s Zooniverse URL, which provides access to spectral energy distributions of each object and user comments. If additional faint sources in a cross-matched catalog are present within the nominal radius at which the AllWISE catalog actively deblends multiple sources (~16”) they are denoted in the columns with *_contamination where the * is represented by A (APASS), G (Gaia DR1), T (TIC), or P (PanSTARRS). The Disk Detective science team invites users to beta test the catalog and provide feedback in preparation for a larger-scale release of the catalog later in 2018. The beta catalog will be operational on the MAST Portal for wide access soon, but in the meantime, people interested in beta testing can contact archive@stsci.edu to express interest. The 10th Data Release of the Hubble Legacy Archive is now available with many new data products and improved processing techniques. The 10th Data Release of the Hubble Legacy Archive was published on January 8, 2018! HLA DR10 is a major release that includes improved images and source lists for the ACS and WFC3 cameras as well as a completely new collection of deep, wide-field ACS and WFC3 mosaic data products. These new products are available to search at http://hla.stsci.edu/hlaview.html and will also be available through the MAST Portal soon. All ACS and WFC3 data that were public as of October 1, 2017, have been processed. This release includes 25% more ACS images and more than twice as many WFC3 images as the previous release. All older ACS and WFC3 images have also been replaced in this release. The new DR10 source lists are being used for version 3 of the Hubble Source Catalog, which will be released in Spring 2018. New deep, wide-field ACS and WFC3 multi-visit mosaic data products have been generated for 1348 fields. The new mosaic pipeline is based on the processing used for the Hubble Frontier Fields images. These images are astrometrically corrected and aligned using HSC version 2. ACS and WFC3 products are drizzled onto a common pixel grid, which makes them very easy to use. See the mosaics FAQ for more information. Images that have a combination of short and long exposures previously had poor data products filled with dark speckles in the sky ('grot'). This problem has been largely eliminated by tuning the astrodrizzle image combination parameters. See the HLA release notes for more information on these improvements and on other new data products, and contact us at archive@stsci.edu with any additional questions or comments. Fig. 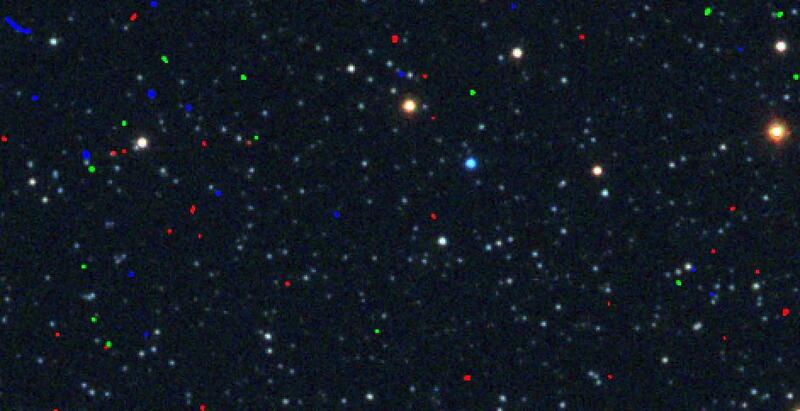 1 - A DR9 image from NGC 6388 can be seen on the left with some apparent misalignment. The DR10 image on the right demonstrates the improved alignment results on the same field.